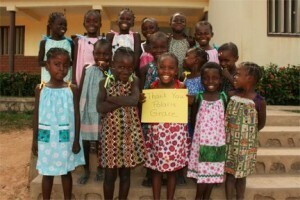 GraceConnect » Happy Girls in Bangui Tonight! Happy Girls in Bangui Tonight! “We brought with us lots of dresses that women from three churches made from pillowcases. The pattern is designed to use a pillowcase, but I know lots of these were made with fabric ~ nowhere have I seen pillowcases in some of these colors and designs! There are ties on each shoulder so they are very growth-friendly. “We enjoyed it so much!! We had the dresses all sorted by sizes and then the little girls were brought from their classes in groups of 10-15. As we measured the dresses on them for length, they were pretty sober-looking. But as soon as we put one over her arm, each gal would break out in a huge smile as she went back to her chair to put it on.